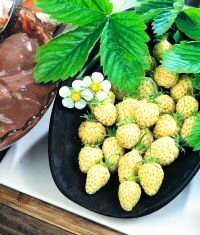 Hardy perennial - Fragaria vesca Best tasting yellow fruits. sweet tasting and aromatic Tasty white-yellow berries that do not attract birds. Tasty white-yellow berries that do not attract birds.